AMMAN — Minister of Foreign Affairs and Expatriates Ayman Safadi has said that preserving the United Nations Relief and Works Agency for Palestine Refugees in the Near East (UNRWA) is a necessary investment to build the peace and stability sought by all. Addressing a special session at the headquarters of the General Secretariat of the Arab League in Cairo on Tuesday, held upon Jordan›s request, Safadi outlined ways to mobilise political and financial support for UNRWA, the Jordan News Agency, Petra, reported. Safadi warned that failure to protect the agency has grave consequences on the Middle East’s security, stressing that Jordan will continue to work with all stakeholders to support UNRWA and enable it to perform its role in serving refugees. He pointed out that the UNRWA faces a severe financial crisis that threatens its ability to play its role in accordance with its United Nations mandate and that this is a challenge that requires extraordinary efforts to address it, stressing that preserving UNRWA and its role is a legal, political and moral responsibility for more than 5 million Palestinian refugees. Seeking further support, Safadi pointed out that the Kingdom will organise in coordination with Egypt and Palestine, and in cooperation with Sweden, Germany, Japan, the EU and Turkey, in its capacity as chairman of the UNRWA advisory committee, a conference on the sidelines of the UN General Assembly’s meetings in New York next month. At a press conference that followed the meeting, Safadi said that the rights of 560,000 Palestinian to health and education are on the line due to UNRWA’s shortfall, noting that global support of UNRWA is a message from the international community that it still remains committed towards the refugee issue and a just solution to the Palestinian issue on the basis of the relevant resolutions of international legitimacy, particularly UN Resolution 194 and the Arab Peace Initiative. Safadi also pointed out that the UNRWA’s financial deficit at the beginning of the academic year was $417 million due to the US decision to slash aid to the agency and providing only $60 million instead of $360 million, which used to be Washington’s contribution, the largest among all donors. Recently, the Trump administration decided to completely halt assistance to UNRWA, in a move seen as a bid to undermine its mission and the entire refugee issue. Safadi added that the deficit has now been reduced to about $200 million, which has enabled UNRWA to open schools in its five operations areas at the beginning of the current school year. On the sidelines of his the session, Safadi met with a number of his Arab counterparts. 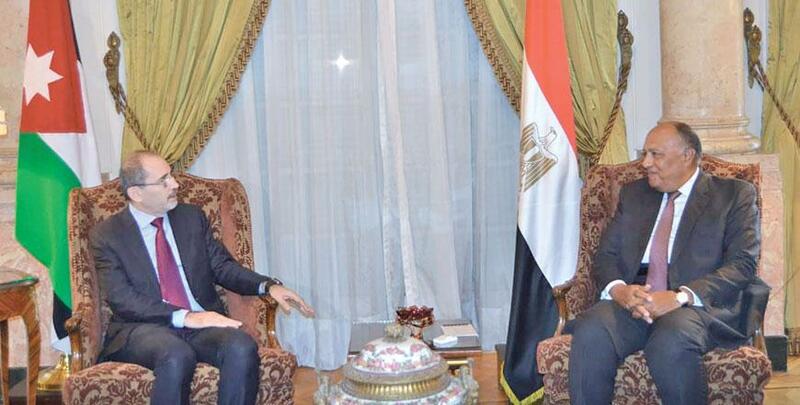 He discussed with Egyptian Foreign Minister Sameh Shukri bilateral relations and developments in the region, Petra reported. Safadi also met with Saudi Foreign Minister Adel Jubair, and peers from Lebanon, Gebran Bassil, Libya, Mohamed Siala and Palestine, Riyad Al Maliki. He also discussed with them bilateral relations and the region. Also on Tuesday, Palestine extended gratitude and appreciation to Jordan for calling for a meeting to discuss the issue of UNRWA and refugees, which are vital issues related to the Palestinian issue.